Udemy.com is a website designed to help millions learn real-world skills on any range of topics, from maths to web development to arts and crafts. 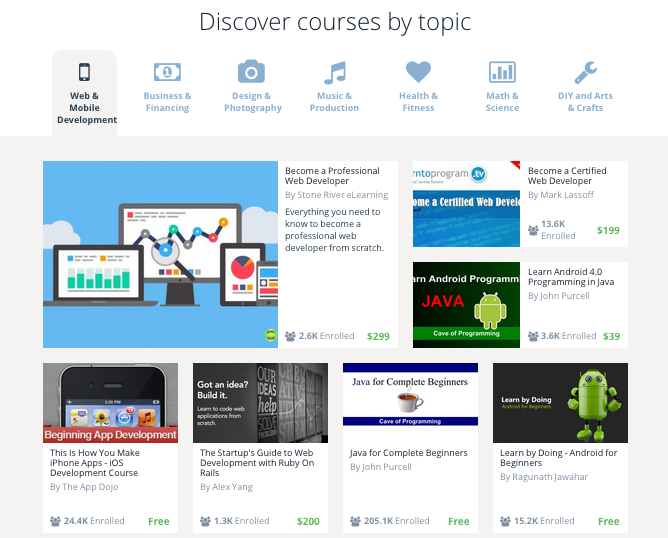 Udemy’s Courses range from beginner tutorials to complex programmes, and while many are totally free, some can cost up to €300. The site also has a blog and useful tips, and for those so inclined, there is also the ability to use your skills to teach others. Black Friday Blowout: Udemy offers over 17,000+ courses for only €13 (up to 95% off) from 11/18-19, but prices will increase by €1 every 48 hours until 11/27, so hurry and get today’s deal! Udemy.com is a fantastic site for those looking for courses in any subject- finding free or cheap courses taught by expert tutors, that can be learned anywhere you have an internet connection, is too much to pass up for those looking for new skills, ideas, and interests. It’s a great site that everyone should try, to find something that could help them later in life. Go back to Free Educational Courses category to find more websites and organisations offering Free courses in London.